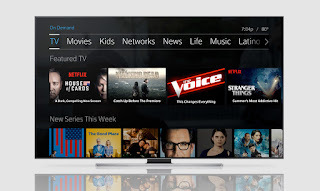 Parental Ideas: Comcast Xfinity X1 now supports Netflix and your Home! Comcast Xfinity X1 now supports Netflix and your Home! Netflix on Comcast Xfinity X1 service. Hey guys! Glad to bring you some updates for Comcast Xfinity service here in Massachusetts. Their X1 service which is pretty cool now supports Netflix as well as your smart home! The Netflix service should now be supported on millions of X1 boxes across the country! We've been X1 customers for the better part of a year now and it's pretty great. Some new updates include faster internet service (by 33% at no cost) in addition to the Netflix service. Netflix content will be fully integrated into Xfinity On Demand, enabling X1 customers to watch past and current seasons of shows available on Netflix. If you're a current Netflix customer you can just sign in through X1 to your Netflix account. It's super easy to use and you can just start it by pressing the voice command button on your X1 remote and say "Netflix". If you're new to Netflix, you can sign up through this partnership and the service will be added to your Comcast bill which will make things easier to pay since it will be on a single bill. The other cool thing about this product is that when you use the Last button on your X1 remote you will see Netflix shows and movies as well as regular TV shows and on-demand items in the last viewed list. As for Comcast Xfinity Home service, this service can be added to your existing subscription as a bundle and you will get the peace of mind home security along with your TV, internet and phone subscription. You can add different devices like cameras, Nest thermostats and other items. You get 24/7 professional home monitoring that can be armed and disarmed remotely, live video monitoring, and remote control of the entire system through your Xfinity apps on your iOS and Android device. NOTE: We were provided with a Nest thermostat as well as a gift card for this review. No other compensation was provided.